Apple has upgraded the specifications of the MacBook Pro Retina. Here is a quick look at what the new machines have to offer. At the Apple event last night, the MacBook Pro Retina got an update. 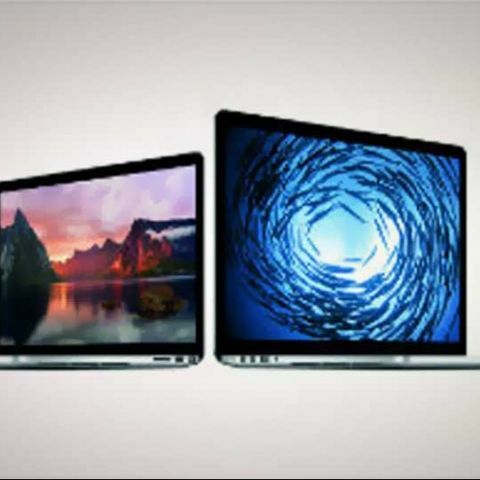 Apple has removed the regular 15-inch laptop from its portfolio leaving only the Retina display devices. There is only one 13-inch non retina laptop available. The entry level 13-inch MacBook Pro Retina is priced at Rs. 99,900 where as the top of the Line 15-inch variant is priced at Rs. 1,99,900. The upgraded machines bring with them a slew of features including Haswell, OS X Mavericks, better battery life, slimmer form factor, 802.11ac WiâFi and more. Here is a specifications comparison between the 2012 Retina MacBook Pros and the ones launched last night. The 2013 MacBook Pros now run on the Intel Haswell chipset. Apple recently updated the MacBook Air with Haswell and the update for the MacBook Pro Retina was long overdue. With the new chipset, Apple claims that the 13-inch MacBook Pro will last for 9-hours and the 15-inch will last for 8-hours. Last years Retina 13 and 15-inchers claimed a battery life of 7-hours. So it’s clear that you will get better battery life from the new MacBook Pros. As you can see from the table above, the 2013 13-inch MacBook Pro Retina is 0.05 kgs lighter and 0.04-inches slimmer than its predecessor. This might not be much but the fact that some weight has been shed is a very good thing. This is the only disappointing feature about the 2013 13-inch MacBook Pro Retina. Last years entry-level model housed 8GB of RAM but this year’s entry-level model has been reduced to 4GB and that is a bummer. The 2012 entry level 15-inch MacBook Pro Retina was priced at Rs. 1,52,900. The 2013 version has been priced at Rs. 1,49,900. Both the 13-inch and 15inch 2013 MacBook Pro house the next generation Thunderbolt ports, Thunderbolt 2. Thunderbolt 2 brings with it better data transfer speeds. The Thunderbolt 2 has data transfer speed of 20GB/s where as the 2012 model had 10GB/s speed. Thunderbolt 2 also supports 4K displays.